Nestled in the woods of Asheville, NC is this modern studio cabin. It’s surrounded by an Asian inspired garden which makes the environment tranquil and perfect for a relaxed lifestyle. The outdoor deck has bamboo privacy walls and it seems like a great space to enjoy a morning cup of coffee while gazing enjoying the nature around you. As you enter the cabin you come into the open living area which incorporates sleeping, living and dining all into one cozy space. The kitchenette has nice windows to allow natural sunlight come in. From the kitchenette you’ll see a high top bar to eat or work on a laptop while enjoying the outdoor views thanks to the large windows. 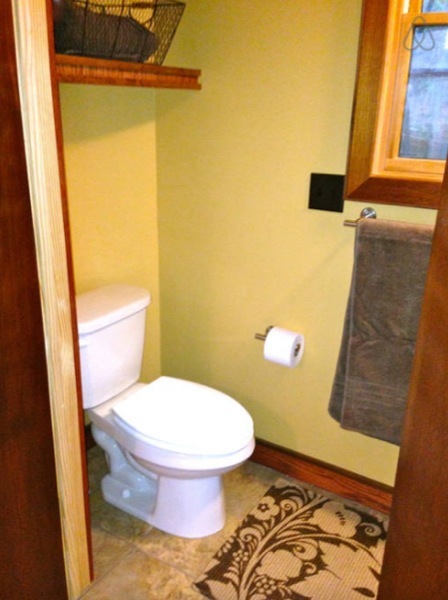 You’ll also find a full bathroom with a small sink, toilet and shower inside. Wouldn’t this modern studio retreat in the woods be a great place to enjoy living simply and relaxing in? I think so! Either way, please enjoy and re-share below if you want. Thank you! You can send this Modern Studio Cabin in the Woods to your friends for free using the social media and e-mail share buttons below. Thanks! If you enjoyed this Modern Studio Retreat in the Woods you’ll absolutely LOVE our Free Daily Tiny House Newsletter with even more! Thank you! Why so many airbnb’s? Here and on Swoon. I wish there were more showing up someplace for sale that aren’t trailered. My husband and I are not in a position to build and going tiny or even small would be great – you just have to find one first. It is interesting to see some tiny homes and of course homes advertised for rent come with lots of good quality photos. I would love to rent one of these to actually sample tiny living. Hopefully you can collect ideas of what you would like and it would help you plan a tiny home or recognise the right one when it is advertised. Lovely cabin. Too bad I don’t really like Asheville. My kids love it and live there so many would find this appealing. Great job. Wonder how far from “town” this is? This is one place I could easily call home.. If you had clicked the very first link in the text you’d have found out it was 300 sq ft.
People… please, before you ask a question, check that your answer isn’t in one of the links that always (almost) come with the articles. Eric, If you click on the first link, it takes you to previous posting about a different ‘Modern Studio’ – not to the information about this particular tiny house. This tiny house information comes from Airbnb, not the builder. im confused is this available to buy or rent?? BEAUTIFUL, Inside and out. Classy inside with stunning gardens.